As I walked my dog yesterday, a guy called to me from across the street, "Excuse me, may I ask: Is your dog walking that way because he just got fixed?" I said, "It's a she. And she's walking that way because she's 17." That way is haltingly, slowly, crookedly, seemingly a little drunk. Often I have to boost her hind quarters at a curb, sometimes even use an improvised (vet-recommended) "sling" on her back end, fashioned from a cloth grocery-store bag with the sides cut out. I carry her up and down the stairs. The other day, someone asked "Is your dog okay?" As if I would would be blithely walking her, oblivious to some problem that made her "not okay," waiting for a passer-by to point it out. "What's the matter with his legs?" is a very common question. One guy who asked the legs question walked on, then stopped, stood stock-still, and stared back halfway down the block as I lifted her up from a pooping position—the look on his face not sympathetic but almost suspicious. I said, "Is something wrong?" He shook his head and walked on. She has had a rough summer, with a sudden lameness in her back legs coming on in mid-June—she couldn't move at all on her own. On more than one occasion, she has seemed to be near the end, but now she's on excellent medication in the right dose for the pain caused by arthritis and a slipped disk in her spine (which is healable, and in fact healing, so there actually is a point to it) and is walking again, and while she has bad days when maybe her stomach is bothering her and she doesn't have a lot of energy (she takes Pepcid and a probiotic every day for her tummy) or when the heat is so oppressive that walking is the last thing she wants to do, she still usually enjoys sniffing around outside, eating her 97-percent-lean ground beef served to her by her 97-percent-vegan dad (she won't eat canned food anymore), snoozing on the couch, cuddling up in bed, and fully being just a very old dog. It is hard to imagine a world without Patsy—and I've said goodbye to three dogs as an adult, so this is not a new experience for me. Putting her down this summer, had it come to that, would have felt very abrupt and uncertain. Now when the time comes, as wrenching as it will be, I think I (and her other dad, my ex) will more confidently feel it's the right time because we did all we could. And I'm glad we did. 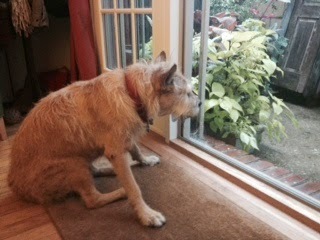 A vet has mentioned the word "dementia," and Patsy does sometimes walk into a corner of the room, uncertain what to do or how to get out of it. I know dementia. I pick her up and turn her around. Amid all the "How old is he?" and "What's his name?" and "Why does he walk funny?" —she's not a he, people, really!—there were two encounters. As I walked along with the sling supporting Patsy's back legs, a man stopped and said, "That's beautiful." Thinking he might have been talking about her beauty (she is beautiful, in her kooky, scrappy way), I said, "What's beautiful?" He clarified: "Just that. So many animals aren't loved." Another day, a woman who had just parked her car toddled over to give Patsy a pat and a hug. "I had to put down my dog a few weeks ago," she said, smiling. "So you recognize that stage of life, huh?"